2018 was quite a year for Karamoor Estate! We are buzzing with change, honors, growth and exciting plans for the future! Let me begin with our fall harvest. It was a difficult year with the terrible weather. I think the sun was on a hiatus! Grapes are not created equally. The different varietals have different qualities, shape of leaves, shape and size of berries and even how tight the berries are in the clusters. The tighter the clusters, the more difficult it is to prevent them from rot and mold because the air doesn’t move freely through to help them dry. Developing a good balance of canopy management is also critical. Too much sun and air can be as damaging as not enough. All of the rain made this very difficult. Joe Rienzi, our viticulturist was quite diligent keeping up with the leaf pulling, so the grape clusters receive better exposure to the sun and to airflow. This and other techniques are key in preventing rot, mold and diseases. It also helps promote optimum ripening and sugar levels in the grapes. So as we moved through harvest, our winemaker, Kevin Robinson and Joe would go through the vineyards, each day checking the progress and quality of the grapes. They would watch the weather forecasts intently. If the grapes were close but not quite ready for harvest, they would evaluate if the grapes would withstand the torrential downpours and wind. I think Kevin referred to it as, “picking before the next deluge”. It’s better to take them down a little early than lose them to the rot, mold or falling to the ground. As the berries mature, their skins become much thinner and delicate so it is better to “use it than lose it”. Hurricane Florence destroyed many of Virginia's vineyards in September. There will be very few red wines from Virginia in 2018. The rain at the end of the season, in combination with a cold snap late in late March, killing many of the new buds ready to pop open, made our season not only difficult but yielded about 40% less than our usual harvest. Because it was necessary to get the grapes off of the vines much sooner than usual, harvest 2018 was complete two weeks early. Another distraction from the usual harvest practices was being on constant watch for the nasty and invasive bad bug, the spotted lanternfly, aka; SLF (Lycorma delicatula) . The SLF are destroying vineyards, orchards and taking over all around our area, especially Berks County. If you see them…kill them and notify the Department of Agriculture. Though they were “spotted” near our vineyards but with swift and proper protocol, we hopefully eliminated future issues. Lot’s of great material in 2018 for my book, “Making Wine Isn’t For Whiners”!! Moving onward and upward, some fantastic news on our vines…we’ve had quite a few exciting visitors, been in the news and added some very prestigious accolades to our trophy case! It started off with a full day visit from Don Winkler, Editor & Mike Potashnik, Publisher of The International Wine Review along with six other, highly regarded Pennsylvania Vineyards and Wineries including; Galen Glen Vineyard & Winery, Galer Estate Vineyard and Winery, Grandview Vineyard, Maple Springs Vineyard, Pennswoods Winery and Pinnacle Ridge Winery. Don and Mike tasted through approximately 30 wines and are writing an article about wines in the northeast and Pennsylvania. Coming soon!! We then had another fantastic visit with Anne and Brian Yost of Wine Tourist Magazine and the The Virginia Grape. We toured the property, tasted through some wines and then they continued on to a few of the Pennsyvania and NJ vineyards. They wrote a great article and took some nice photos. I will include all links at the end of this blog. 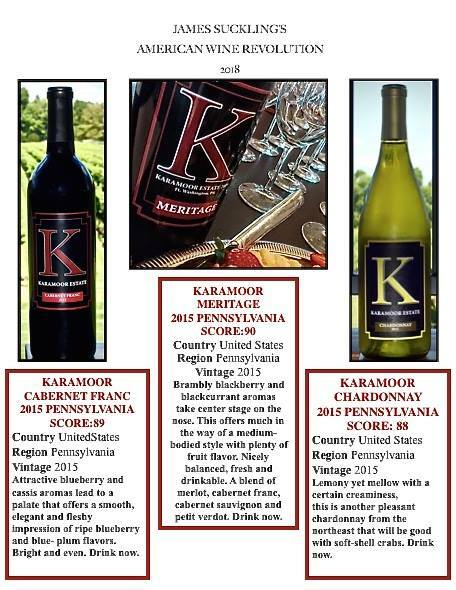 The next honor and surprise was Karamoor Estate’s 2013 Merlot Reserve, being named Forbes Wine of the Week!! Followed by medals from the San Francisco International Wine Competition! On the heels of these awards came the announcement of James Suckling’s American Wine Revolution reviews with Karamoor receiving 88, 89 and 90 points! This past weekend we received the announcement from the largest competion of American wines in the world: The San Francisco Chronicle Competition, Karamoor Estate received 5 medals! One gold and four silver!!! Up against the biggest and the best with over 7000 entries...we are quite proud!! Congratulations to Mr. and Mrs. Karabots for their vision, making the commitment and the hard work to produce world class wines AND to Kevin Robinson, Joe Rienzi and the rest of the team for their hard work and excellent viticultural and winemaking skills! All of these honors took each of us back to a quote made last year by Philadelphia’s famous food and wine critique - Craig LaBan, "Still surprised that good wine is made in Philly's suburbs? I'm not, especially from Karamoor, the passion project of Nick and Athena Karabots, who have done everything right to get the most out of their Montgomery County terroir, with impressively drinkable wines from the first vintage." A couple of additions to our programs at Karamoor, if you are a Wine Club member. In addition to the list of perks as a member we have added “pick up parties” which will take place and be an option when it’s time for your club releases. We introduced the idea last October and received favorable responses! We will let you know when the next release and pick up party will be taking place!! Even more exciting is the view of the tasting room located on Butler Pike!! The cement has been poured and the timbers will be up in the next few weeks!!!! Woot! Woot!! I think we’ll be seeing you in the Tasting Room this summer!!! A couple of dates have been posted for the upcoming week Tasting &Tours! There are always some good wine specials during our tours. If you’re not a Wine Club member, you may want to check it out! The perks and the fun that go with the membership keep getting better!! Like a new season for our vines, our goal is to learn, grow, establish and be stronger every year with everything we do! We are thrilled you enjoy being a part of our growth and success! Cheers! To a Happy and Healthy New Year from all of us at Karamoor Estate!! See you in the vineyard! Six weeks into the new plan and taking root, I’m beginning to see the first hints of new business starting to bud. Every day is a little busier, some things a little easier, overall an exciting experience! When I’m in the vineyard and winery in the past week, it feels like the calm before the storm. There’s not a lot of talk about what’s about to happen with the harvest and crush, but you can feel it. You see it looking down over the vineyards, with more workers tending to the vines. Now is the time when the vineyard is under close watch for bugs, birds, disease and fungus. The nets are unrolled and pulled over the fruit. The beauty of the grape bunches with the onset of “veraison” (ripening and accumulation of sugars), the trimming of the vines, the fullness of the vineyard. So much activity! I sense when it hits…we are going to be juiced!! (Sometimes I just can’t help myself). In the past weeks I’ve conducted a number of tours and tastings. Our Wine Club and interaction within social media are growing and there seems to be a bigger buzz of interest from outside of Karamoor. I invited our second group from the food, beverage and hospitality industry, including representatives from: 12th St. Cantina, Mid-Atlantic Events Magazine, ARAMARK, YPO, 2300 Arena, Valley Forge Tourist and Convention Board, WP Palmer Distilling, Bluestone Country Club, Cantina Feliz, Normandy Farm Hotel Corporate Planning and Wine and Spirit Industry Executive, Chris Papariello. We had a great night, with a very positive response from many who never imagined wines of this quality could come from a boutique sized vineyard, especially here in Pennsylvania. We are coming to be a world class wine producer. I compare Karamoor’s wines in the wine world, as the California wine was to the French in the movie, “Bottle Shock”. Someone well known in the wine environment is going to try Karamoor wines and have an “aha moment”. When that happens, Mr. Karabots will need to tell a new story about owning a vineyard. I asked Kevin, our winemaker, Joe, our viticulturist for their short take on what is happening here at Karamoor. Once again, with no discussion of my request between them, they had very consistent thoughts. Kevin’s thought was verbatim with mine, I had already written it into the blog. Joe; “We’re only going to get better from here, not only from the vineyard & winery perspective, but as a brand overall”. This is a really great sign. It’s clear we are all on the same page, all feeling very similar growth and energy. We definitely have some learning curves, some dialing in to be done and we continue to maintain the growth and improve upon what we learn. It's all good. Like the grapes, we’ll be hanging in the vineyard… and loving it! For the last couple of years, I’ve been in planning mode. What’s next? Where do I go? Big change? Baby steps? Sell everything? Get out of Dodge (hee-hee-hee ~ you’ll get it as you get to know me)? Life is full of surprises and challenges. Sometimes, a few too many? All character builders. I grew up in Blue Bell, formerly Pigeontown, Pennsylvania. I attended Germantown Academy. I love sports, participating in them more than watching. I was always very active and in addition to sports, was always busy doing something social or working somewhere in the area. I was not very good at sitting still. When I was 14 or 15, I started working for a woman who had a nice little catering business. I loved working for her! Many moons later, I’m still in the food and hospitality industry. I graduated from The Culinary Institute of America and have done almost everything possible within the food service industry. Too much to list here. This is a blog not a novel. My strong suits are, sales and marketing. I had many years of practice with my own company, Culinary Crossing, which started in the Gwynedd Valley train station. Since I sold Culinary, I’ve read, googled, researched and read some more. I’ve talked to people, so many kind people… to try and figure out what was next. What was important to me? Do I want to start a new business? Do I want to be in the city? Work out of my home? I came across an article I saved. I don’t remember why I was reading it? Perhaps I was considering planting a vineyard behind my house? LOL!!! I wish I had written down every idea I had over the years. As I read this article I thought, hmmm…these sound like good questions about planning what’s next in my life. It reminded me a bit of the movie Being There with Peter Sellers as Chauncey Gardner and Shirley McLain as Eve. Good movie. Anyway, the article was titled: “Planning Your New Vineyard” or life in my case. I filled in my answers to their headings. The Land ~ Where I grew up, close to amazing friends and my Dad. Vineyard Orientation ~Work within a fifteen miles of home. Stay in the right longitude with the best attitudes. Time ~ Don’t get overly ambitious and take on more than I can comfortably manage. Tools ~ A very wise man once told me, “take good care of your equipment and the equipment will take care of you”. (Thanks Dad!) Always have a back up plan, back up equipment, diversity and cross training within your bag of tricks. Books ~ Keep reading, keep learning. Did I mention the woman whose nice little catering business I worked for is less than 1/4 mile from Karamoor Estate? I think I’ve gone full circle! !